Dr. Bradford Patt and the Houston Center for Facial Plastic Surgery is pleased to be one of the 1st practices to offer the innovative cosmetic skin lifting and tightening procedure known as Ultherapy®. This recently developed nonsurgical treatment utilizes ultrasound to lift, tighten, and tone loose skin to provide a fresh and rejuvenated look, without the need for intervals. Right after the first Ultherapy Houston treatment, your skin will gradually shift back into a more youthful look. Ultherapy is not to be expected to replicate surgically initiated results; however, it is a new and exciting alternative to surgery. Individuals can choose this option if they are not ready for full facial plastic surgery, yet seek significant results. Below, Houston’s Dr. Patt shares more insight on the tightening and skin lifting effects of the Ultherapy procedure. Ultherapy is a nonsurgical noninvasive procedure that is the only FDA-approved procedure available for effectively lifting facial skin around the brow, chin, and neck areas. Part of the beauty of this fantastic procedure is the way it capitalizes on your body’s natural healing process. 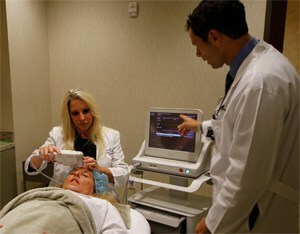 Ultrasound technology is utilized to lift and tighten skin from the inside out. This treatment does not work like a laser which penetrates through the skin; however, Ultherapy stimulates certain layers of deep tissue within the structure of the skin. At the same time, the surface of the skin is not disturbed at all! Treatments are outpatient based in the office, and typically last 1 to 1.5 hours with no activity restriction following treatment. Results are generally noticed in less than 3 months, and continued improvement takes place for up to 6 months. Patients see these aesthetically pleasing results of lifting and tightening of the skin on the neck, under the chin, along the jawline, and on the neck. Prior to an Ultherapy procedure, absolutely no preparation is necessary other than the possibility of some medication being prescribed and taken for comfort enhancement (this typically depends on the patient as well as the area being treated). During an Ultherapy procedure, the medical team will apply ultrasound gel to the areas that are to be treated once skin has been cleansed. The ultrasound energy, which completely bypasses the skin’s surface, stimulates collagen growth deep in the skin tissue. After the procedure, there may be a flushed look to your skin; however, any redness should subside after a few short hours. There are no restrictions on personal activities, and no special measures you have to take. For a few days, some patients may have some light swelling; and for a few weeks, some may experience tenderness (even slight tingling) to the touch. Know that such side-effects are common, mild, and very temporary. Less common post-treatment side-effects include small areas of bruising or numbness. These are rare, but are also temporary. If you are seriously considering Ultherapy treatments, the Houston Center for Facial Plastic Surgery is the ideal medical practice to seek answers and consult with Dr. Patt. As one of Houston’s “Top Docs” for 7 consecutive years, patients feel comfortable asking Dr. Patt pertinent questions about Ultherapy and many other nonsurgical or surgical procedures. Patients can expect to obtain professional and expert evaluation and recommendations from this respected Ultherapy Houston medical expert. Dr. Patt provides in-depth evaluations and facial treatments as part of the scope of his practice and specialty, which also includes various kinds of facial reconstructive surgery. Call (281) 649-7170 for an appointment.